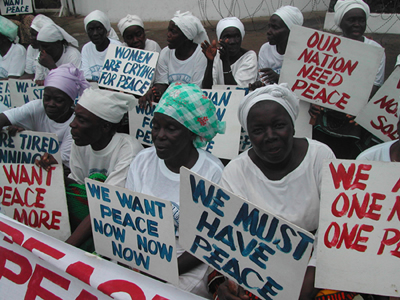 War ravaged Liberia didn’t know what hit them when a group of brave, determined women demanded peace and got it. Pray the Devil Back to Hell by filmmaker Gini Reticker is an interesting and unflinching documentary that recounts the circumstances that drove the women of the country to join forces and make a statement against a maniacal dictator, rebel factions and warlords. In 2003 Leymah Gbowee inspired the women from her Christian church in Liberia to come together daily for a non-violent protest against the war. It didn’t take long for group to grow and diversify, with women of other faiths joining in solidarity for the cause of peace. Soon too the broad objective became more specific, multi-layered and determined. First they had to get the warlord president Charles Taylor and enemies to agree to attend the peace negotiations in South Africa. Once there, they have to find a way to find a way for the talks to amount to more than just a horse and pony show. The women come up with impulsive and creative means to ensure peace is discussed and contracts are signed. They maintain their efforts by monitoring the implementation of peace, submission of guns and democratic elections of what ends up being the first female president. Pray the Devil is not an easy film to watch mostly due to the horrific and prevalent images of war. And although it is an interesting and important topic of which Reticker got incredible access and demonstrated necessary restraint, it is not necessarily a riveting film, in fact it is a bit thin. This is mostly because it becomes unnecessarily repetitive of the demonstration scenes and talking heads, but leaves too many questions unanswered. Coming in at just 72 minutes it appears that there was time for more insight into the subject’s history, characters and general story information. Despite that it is worth experiencing the strength and determination of these women and watch the process of peace unfold. These are the times when we realize here and elsewhere that every vote counts and every voice can be heard- change can happen.